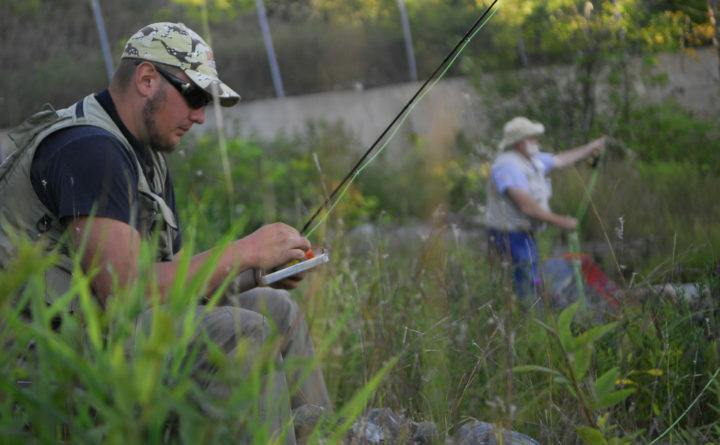 Beau Peavey of Glenburn rummages through his flies while sitting on the bank of the B Pool below the Veazie Dam in September 2007. Up river from him Ira LePage of Glenburn, president of the Veazie Salmon Club, casts his line. 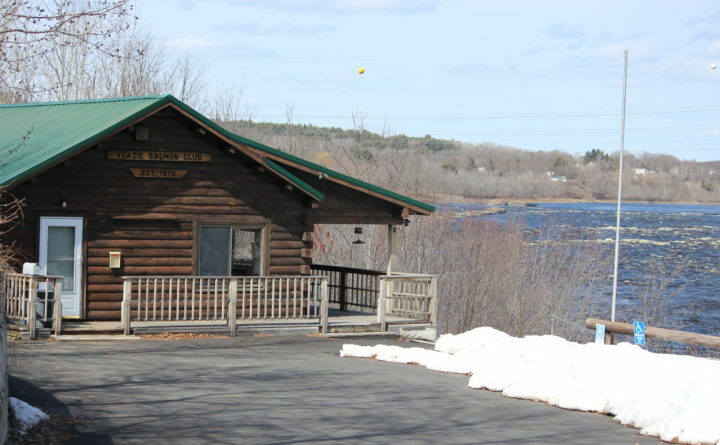 The Veazie Salmon Club, which since the 1970s has hosted anglers from around the country as they fished the productive Penobscot River pools below, will cease to exist in the coming months, according to a longtime member. Interest in the club has waned in recent years, as Atlantic salmon have been listed under the federal Endangered Species Act and no salmon fishing has been allowed on the river since a short, experimental season was staged in 2008. Member Gayland Hachey, who owns a fly shop in town, sent out an email on Thursday that announced the club’s demise. Under the heading “DEATH OF THE VEAZIE SALMON CLUB,” Hachey offered an update on the club’s future. On Friday afternoon, Hachey explained that the club just doesn’t have enough members to keep it viable. “The big problem’s been a lack of members. And the ones we do have, most of them are 70 years old or older and they aren’t paying any dues,” Hachey said, explaining that the club put in a “senior” category several years ago that makes membership free for those older than 70. In the years since salmon fishing was closed, first in 1999, and again in 2009 after experimental seasons were held, the club has served as a spot for members to socialize during the mornings. Each day from 8 a.m. to 10 a.m., as many as a dozen former salmon fishermen would gather to play cribbage, Hachey said. He was always among them, and come 10 o’clock, he’d head back to his fly shop and open for business. Those cribbage players are largely gone, now. Hachey said that after sending out the email he received return messages from around the globe, from people pledging money that totaled in the thousands of dollars. But he said he doesn’t think the donations will change the club’s fate because there simply aren’t enough younger members to take over administrative duties and attend meetings. The club needs about $5,000 a year in order to pay for expenses, Hachey said, but with no salmon fishing on the river, younger people aren’t interested in joining the club at all. The Veazie Salmon Club was founded in 1978, and the clubhouse was built in 1984. Hachey, who was one of the founders, said the club owns the clubhouse itself, but the land it sits on belongs to the town of Veazie. The club is one of three salmon clubs on the Penobscot. The Penobscot Salmon Club in Brewer is the oldest, and members there worked on a since-abandoned proposal to build the Maine Atlantic Salmon Museum on the site. Farther upriver sits the Eddington Salmon Club.